The detail on this statue is fantastic he stands at 6ft tall and he is attached to a base. He is a Ram headed god associated as the God of the River Nile, the Khnum makes for a great talking point in any home or themed premises. 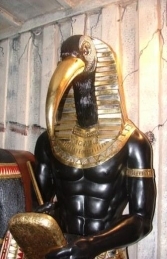 An army of these would look impressive lined up leading to any Egyptian themed room or venue.